Each October, certain North American cities take a moment to savour the rich history and the flavourful traditions that make pierogi such a treasured and tasty treat. And nowhere do they love pierogi more than in the commonwealth of Pennsylvania – a state that, according to Mrs. T's Pierogi, a big commercial pierog maker, purchases more pierogi per capita than any other U.S. state. 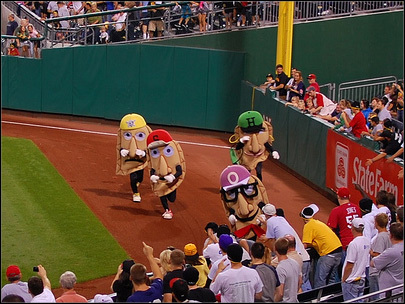 In fact, Pittsburgh, Philadelphia, Harrisburg, and Scranton/Wilkes-Barre are all included in the top 10 U.S .pierogie markets. The Pittsburgh Pirates hold a pierogi race during the bottom of the 5th inning at home games. There are “pierogi days” festivals in Indiana and Connecticut too- but what about the rest of us? How come we aren’t enjoying those succulent filled- dumplings? We might have come close without knowing it because pierogi-like products are truly worldwide. 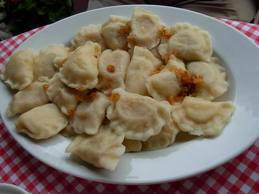 Pierogi (singular-pierog) are a little like Italian ravioli, Ashkenazic kreplach and Oriental wontons. Basically pierogi are filled dumplings, usually semi-circular, of unleavened dough which are first boiled and then baked or fried in butter along with fried minced onions. They are usually stuffed with potato filling, cheese or ground meat. In certain parts of the world pierogies are very popular. The Western Slavs (Poles, Czechs and Slovaks), the Eastern Slavs (Belarusians, Russians and Ukrainians) and the Baltic peoples (Estonians, Latvians and Lithuanians) all consider pierogies their own, even though they all spell them slightly differently. There are different ways to make pierogi, but I remember dough made with sour cream in it that was so wonderful. You don’t have to be Polish to love pierogi. I like using the untraditional ricotta cheese for this, which everyone absolutely loves. Roll the dough on a floured board to1/8 inch thickness. It must be thin. Press the edges together with a fork. If having trouble making them stick, use a little water on the edges. Fry finely chopped onions in butter until softened. Then add the pierogi and pan fry until lightly crispy. Serve the pierogi and onions with sour cream on the side. When October rolls around, you can be ready to serve these delectable dumplings. If you enjoy making these, you’ll find plenty of folks to share them with. I've never heard of pierogi until now! How interesting. Maybe I'll try it one of these days. I've never made my own but I do love them as do my girls. Thanks for the recipe-I may try it. My mother in law makes her own too. I haven't tried it and probably won't unless I can start eating things like that one day. My poor Hus suffers because of my illness.... but he really needs to lose weight so I am doing him a favor. Delicious pierogi, are very similar to Spanish empanadas. Greetings. My mom knows someone who likes pierogi--I'll have to bookmark this recipe. Looks so good. And I like your stories and the 5th inning race one. NUTSCHELL: Thank You, a good weekend to you too. JOYCE: It takes a bit of commitment to make your own, but if you can get them otherwise, that's great. Have a nice weekend. MY JOURNEY WITH CANDIDA: You are in our prayers. Our pastor had a bad case of hepatitis, a couple of weeks ago he told us it was completely gone. We praying for my spouse also. But your spouse can get what he wants at P.F. Changs, no? LEOVI: You are right, I should have mentioned that. Thanks. THE GOLDEN EAGLE: OK but tell your mom to get one for you to try. MANZANITA: Hands-on food is good for kids, up to a point. A lot of countries, they eat with three fingers of their right hand only. I just saw Hitchcock's "The Man Who Knew Too Much" with Jimmy Stewart where he ate that way. DEEPS@NAUGHTY CURRY: It is like ravioli but a little different,and you are sure to enjoy it. When I lived in Stratford, Connecticut, my great-grandmother used to make the most delicious pierogies going. It was the only redeeming value the old bag had. That, and her poppyseed rolls. By the way, she was Slovak. Born when Slovakia was part of the Austrian-Hungarian Empire. This would tend to explain the autographed, 8 X 10 glossy of Emperor Franz Josef hanging in her sitting room (the one with plastic on the furniture). Correct, My Hubs can eat almost anything he wants with no problems. Once in awhile, peppers will give him problems and sometimes garlic. Pierogi lovely pets in the party of baseball. Greetings. Hmm Yum! Thank you for sharing the history behind the pierogi and this delicious recipe. AL PENWASSER: The ONLY redeeming value? You a tough judge Al. But funny. Btw, my spouse's best friend lived on a houseboat at the Stratford Marina. My spouse went to SoConn. AL PENWASSER: Didn't know they had 8x10 glossies back then. But of course, everyone had plastic furniture. MY JOURNEY WITH CANDIDA: Well at least one of you doesn't suffer torment. My best wishes to you. LEOVI: Yeah, one "pierog" got fired for bad-mouthing a manager of the team. CLAUDIA DEL BALSO: You are welcome, Thanks for calling. SCHMETTERLINGWORDS: Thank You very much. Bummer! It's full of everything I can't eat. And I've never found a good veggie substitute for ricotta cheese. Don't even remember the last time I ate lasagne. L. DIANE WOLFE: Bummer indeed but perhaps I can help. I have made those "stuffed shells" with tofu and a little ricotta cheese. I wonder if one could stuff pierogi with mashed tofu. If you allergic to ricotta, they can also be stuffed with cottage cheese filling or potato, even sauerkraut. Regardless, I wish you well. Oh wow, I've not heard of pierogi before. It looks and sounds yum! I'll have to give it a go. OMGosh my grandmother use to make these all the time. I've haven't found one that I like yet. I cant' wait to try this! Thank you! On the kettlebell I really love it! I found mine at Walmart for like $8 it's not the extended one where you can add more weight but it works. I know Ross has them every once in a while also. Hi, Anthony. I've nominated you for an award. You can stop by my blog to pick it up. LYNDA R YOUNG: Thank You, these are wonderful ethnic delights. ALEXIS AKA MOM: You will love these. My spouse the Tipster raves about these. I haven't seen kettlebells at WalMart, $8 is a good price though. I bought a 30 pound dumbell at a garage sale for $3 and saw a duplicate at K-Mart for $23. I can understand because of the weight of it. I like that KBell exercise where you swing it through your legs and then up to head height. I simulate that with a dumbell, but my neighbour, who really knows anatomy and kinetics says the KBell, because of the pendulation, is better. SUSANNE DRAZIC: Thank You, you are very kind. My brother and brother-in-law went to SoConn. I went to Central Connecticut, six other universities, Clown College, and some bitchin' keggers. OK, you're right. Great-grandma did have one other redeeming quality. I have got to stop coming here on an empty stomach! everything AlWAYS looks yummy! I want to open up a pierogi shop called It's Your Pierogitive. Never heard about this pierogi before. But bookmarking rightaway. the procedure looks easy. AL PENWASSER: That's about 8 colleges. You are either very well educated or failed a lot. That clown college, are those students there serious about learning to be clowns or just clowning around? Do they get those shoes at the campus bookstore? Great grandma would give you such a smack if she heard you. Maybe with that Franz Josef portrait. MISSED PERIODS: Excellent wordplay here, and you did not miss any periods, but may I say that a colon or quotation marks would have been more appropriate after the word: called. Just kiddin', I laughed aloud, actually guffawed and chortled extensively. Thank You for calling. UMA: There is a type of pierogi in the Indian state of Gujarat called "Ghugra" that they serve at Diwali. I never had it, but it too sounds good. Forget October, I'm trying these babies now. I'm also a big fan of meat pies from the Phillipines and Doubles from Trinidad. I really enjoy the commentary and comments, but watch out for Al, Al's trouble. re: my hubs in Turkey...he always enjoys the local cuisine when he travels : ) He takes pics on most trips and they're all food! He is not in the food business fyi. We were loading them on facebook this weekend and he said, 'hmmm...they're all food?' My kind of travel! It sounds like a lot of work, but would make a great weekend cooking project for me. I may have to get ambitious and give this one a try. Pierogi, yum! I'll have to see if this recipe is close to the one I have. Haven't tried making them homemade, yet. There are a couple of stores I shop at that carry the farmer's cheese ones I like. GENE POOLE DIVA: I know what you mean, almost everywhere there is some form of pierog, the caribbean ones are nice. Al is a trip alright, but funny, really funny, like you and Dawn. JOYCE: To me, your spouse is lucky, getting to travel and taste all over as he does. He would probably disagree with me, preferring to spend more time with you and the girls. JEAN: We love them too Jean. SUSAN OLOIER: It's not really a lot of work if you set a mise en place and organize the steps but I think it could be if you are not used to it. Susan, if you do actually make pierogi, I hope Zane likes it. Regardless, my best to him. SUSANNE DRAZIC: I can't get that kind of farmer's cheese but I have good luck with ricotta. And I think the sour cream is de rigueur. You'll love pierogi. JAY: Thanks, they are really good. Never heard of this dish before, but the wontons looks yummy and I wish I could taste them now! And thanks for the valuable background info. MISHA: Thank You, I agree with you. Enjoyed your "origins" post. PLATEFUL: This dish has cousins all around the world under different names and is dee lish. Thank You for your kind words. Potato and tofu would have to do - I don't eat any dairy products. They would probably make me very sick now. L.DIANE WOLFE: Potato and tofu are good groceries, I'm sorry that you have to be so careful though. Please take care of yourself. LIZZY: I loved Indiana in the early 1960's, was stationed at Fort Ben Harrison and watched the trials at Indianapolis speedway. Didn't ever see pierogi though. But in Wilkes-Barre they are almost everywhere. My better half is estonian-descent (1st generation). Her mother taught me the estonian version(s) of pierogi. The dough isn't really the problem, it's the filling. Most eastern states will use some kind of cabbage/meat or cabbage/cream filling. Egg/ meat fillings are also used. The dough the mother-in-law taught me was a yeast dough that had to rise. It wasn't cooked, but baked. The cooked dumplings of the eastern european countries are called pelmeni and are usually filled with a pork/onion mixture and served with a dollop of sour cream. oh wow going thru the recipe i find them absolutely delicious. the way you cook the batter is so interesting. how do you pronounce pierogi? ALEX: Thank You so much for stopping by and commenting. I am most familiar with the Polish version but recognize that there are a vast multitude of different styles.